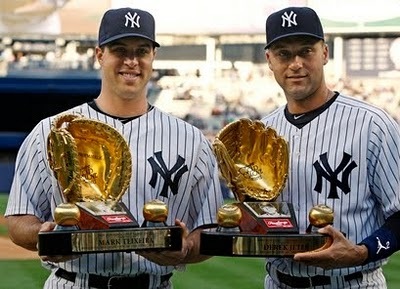 Mark Teixeira and Derek Jeter earned their third and fifth Gold Glove, respectively. The 2010 American League Gold Glove awards were announced today and a record three Yankees took home the hardware. Although not the trophy they were hoping to possess, Mark Teixeira and Derek Jeter both added another Gold Glove to their mantle, while Robinson Cano earned the honor for the first time. Although the selection of Cano and Teixeira were both widely accepted, the choice of Jeter was predictably met with derision in many quarters. That discussion has already been dissected by many others, so let’s push it aside and focus instead on the historic nature of the Yankees’ gold rush. 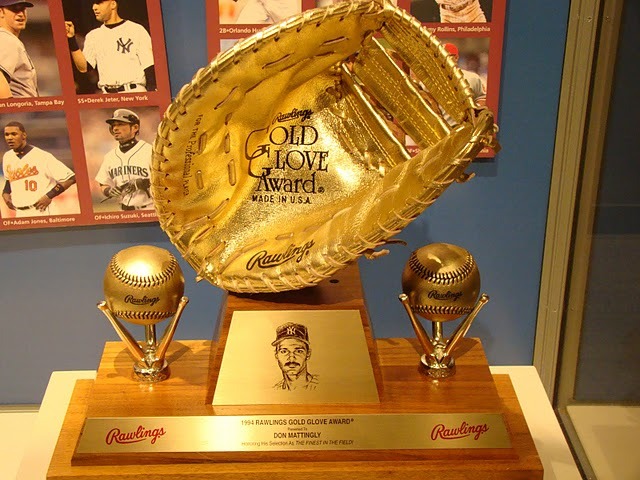 Since the gold glove award was created in 1957 (that first year, one selection was made for the entire major leagues), the Yankees have had three selections only two other times: in 1985, when Don Mattingly, Dave Winfield and Ron Guidry were honored, and in 1965, when Joe Pepitone, Bobby Richardson and Tom Tresh won the award. This year, however, marked the first time that three Yankee infielders took home the gold. The only other American League clubs to also have three infielders win the award were the 2000 Indians (Roberto Alomar, Travis Fryman and Omar Vizquel) as well as five Orioles’ teans from 1969 to 1975 (Mark Belanger and Brooks Robinson along side Davey Johnson for two and Bobby Grich for three). * Vic Power won the award in 1958 while splitting time with the Athletics and Indians, and in 1964 while splitting time with the Twins and Angels. In 1973, Jim Kaat won the award while splitting time with the Twins and White Sox. Don Mattingly's nine Gold Gloves are the most ever by a Yankee. With their three honorees, the Yankees also extended their American League leading gold glove total to 62, four ahead of the second place Orioles. Although the Yankees hold the top spot overall, they only lead in total awards at two positions (pitcher and first base), while the Orioles rank ahead in three (2B, SS and 3B). The other positions are led by the Rangers (16 at catcher) and Mariners (24 in the outfield).